You guys – this is a good one!! First wedding of the year, and I couldn’t be more excited! I have such a soft spot in my heart for these two (maybe it is because they’ve modeled for me in the past…) or maybe it is because they are just as beautiful on the inside as they are outside. Seriously, we are talking about some good souls. These two had the best “relaxed, go with the flow, let’s just enjoy everything about this day” attitude. Lauren got ready at the Hilton in downtown St. Pete with her best group of friends. Her makeup was applied flawlessly and she looked like a Hollywood star! Those lashes! Those lips! Her mom helped her into her beautiful, lace, v-neck, strapped gown. What was even more special was the fact that her mom used the same hook to close the button loops that had been used on her wedding day many years ago. Dave and his friends got ready down the street. He passed out berry-colored ties and pocket knives as groomsmen gifts. They strolled down Beach Drive and headed to the Museum of Fine Arts to get the party started! Lauren and Dave had the cutest first look! Can’t even handle it you guys! The way that Dave kept his eyes scrunched up all tight and then just had the biggest smile on his face when he saw Lauren for the first time…absolutely adorable! They both couldn’t stop smiling – which is just the way it is supposed to be! I also felt on top of the world because (not only was I shooting the perfect wedding day…but…) they gave us so much time for photos that we were able to knock everything out before the ceremony – which allowed these lovebirds to enjoy cocktail hour with their guests! Before we knew it, it was time for the ceremony, which was officiated by Dave’s grandfather. Simple, short, and sweet, the ceremony did just what it was supposed to do: officially put these two together as husband and wife! The party got started inside the beautiful Museum of Fine Arts. The space was set beautifully! 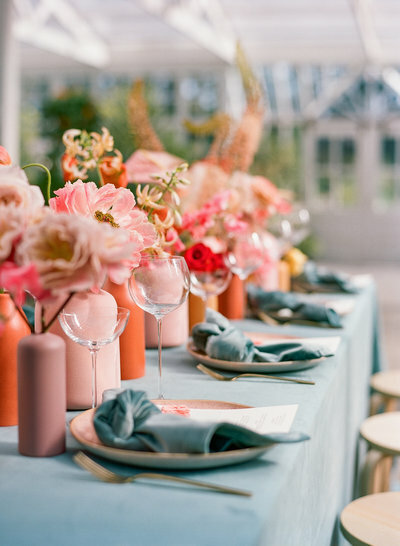 Each table had a unique centerpiece, whether it was a larger vase of flowers, or smaller clusters of vases and candles. A small bottle of olive oil, complete with a recipe, sat at every place setting, as a nod to Dave’s heritage. It was a fantastic evening filled with heartwarming toasts and a raging dance floor! Lauren and Dave, thank you so much for everything! I’m so grateful that we became friends and things worked out the way that they did (and you didn’t think I was crazy when our paths first crossed…)! You two are a remarkable couple and I can’t wait to see what the two of you accomplish! I truly hope this is just the beginning of our friendship! Hugs!